Nothing makes an outdoor, winter hot tub more rustic and comforting than an open fire - especially if it's heating your water. Originating in northern Europe centuries ago, a wood-fired hot tub is a simple design that runs off the principles of thermodynamics. The water is heated by means of a circulating pump; the fire creates a vacuum that pushes the heated water up while intaking colder water. Water warms evenly, with minimal fire maintenance. Made in the Netherlands by Weltevree, this unique design comes offers a more sustainable luxury. 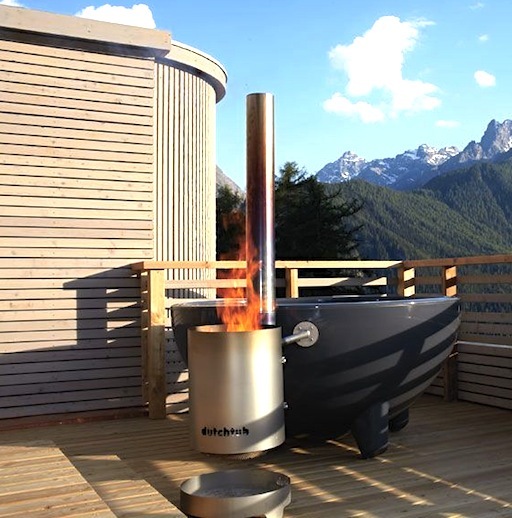 The Dutchtub comes in a variety of colours and a wooden design, is relatively lightweight and made to be portable. The open flame can also double as a grill.